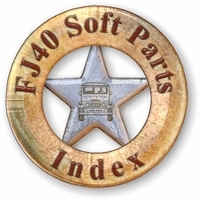 FJ40 Door Panels, Sold in Pairs. Made of tough UV protective Vinylized ABS plastic that's vacuum-molded to yield a realistic leather grain finish (like original finish) and last a lifetime. 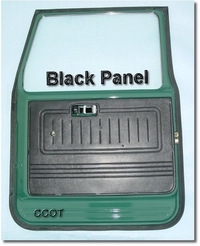 No more cut or gouged door panels. Original in every detail and comes complete ready to install with mounting clips. Panel holes are pre-cut for pull strap, window crank and door lever. Gray Panels are made of tough UV protective Vinylized ABS plastic that's vacuum-molded to yield a realistic leather grain finish (like original finish) and last a lifetime. Black Panels are made of tough UV protective Vinylized ABS plastic that's vacuum-molded to yield a realistic leather grain finish (like original finish) and last a lifetime. 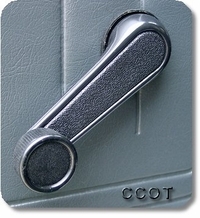 In Africa, the "Serengeti Door Panel" quickly replaces the OEM door panel when it becomes torn, gouged or ripped open from the true harsh use a Land Cruiser is exposed to in Tanzania's Serengeti. 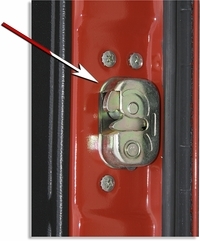 This nearly indestructible door panel is precision Laser cut from 1/8" rust free aluminum plate that attaches to the inside of door face by way of self tapping black zinc phillips washer head trim screws into nylon door nuts. 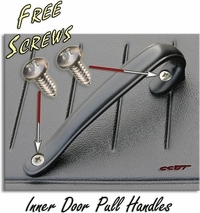 For the first time, this simple and strong fastener system makes door panels easy to install and easy to remove for access to door adjustments (door lock / handle, window regulator, etc). Panels are satin black powder coated with a highly scratch resistant closed grain pebble finish that does not hold dust and easily washes to look like new with the sweep of a moist rag. 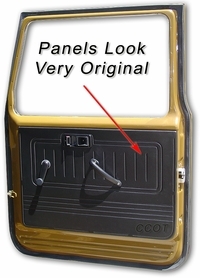 When installed, the "Serengeti Door Panels" look as if they should have been OEM equipment for Land Cruisers. 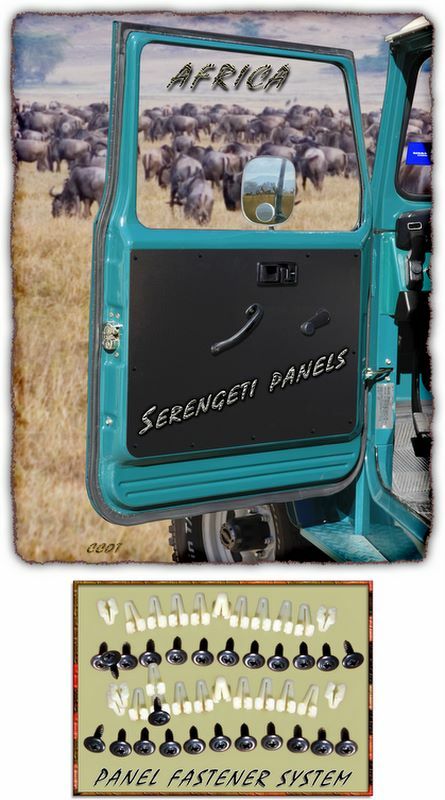 The "Serengeti Door Panels" are the best and the last door panels you'll ever buy for your Cruiser. 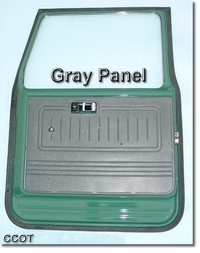 Finally, a door panel that matches the toughness of the Cruiser itself . . . . 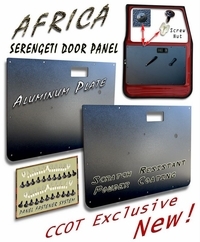 The "Serengeti Door Panel"
Comes complete with all Installation Hardware. First remove black bezel that fits around the door open lever / lock assembly. 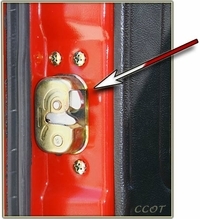 Next remove the door pull strap and window crank (remember that the window crank has a hidden cross retainer clip to remove). 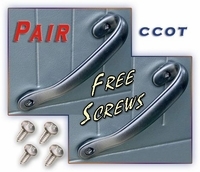 Then with a stiff 1" putty knife or wide bladed screw driver, pry up on old door panels and pop loose the old panel retainers / fasteners from the old door grommets. 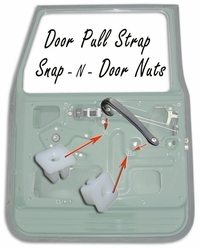 Once old door panel has been removed, then overlay the new Serengeti Door panel over your door and mark old door grommets to be removed. 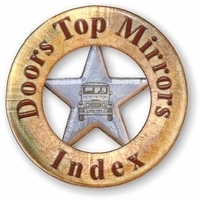 Note: This is a good time to vacuum out the old moisture holding debris (causes lower doors to rust) from the inside bottom of your doors to allow water to drain out as designed. 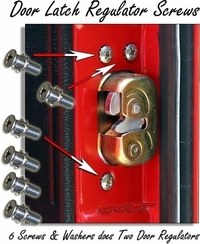 Once old grommets are removed, then install in the same 5/16" hole the new cone shaped nylon nuts (11 ea.) into each hole. Install the door pull strap last (don't tighten yet). 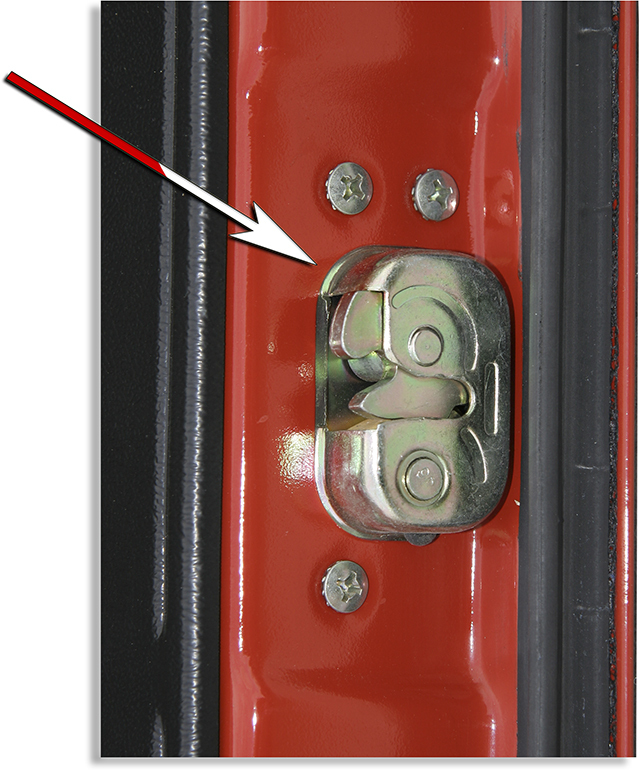 Once all screws have been started in their nuts you can begin to tighten screws a little at a time to make sure panel installs properly seated. Last, install the window crank and clip. Installation by "Kids on Trucks"